In the first post in this series I wrote about how to create E2E (End-to-End) tests for Ionic 2 applications. This was a very basic introduction that focused on the general concept and getting a bare bones example up and running. I intend to create a few more tutorials that will go a little more in-depth into E2E testing and discuss how to better integrate them into your testing strategy. In this tutorial, I will be discussing how you can use page objects in your E2E tests to make them more maintainable and easier to write. We will discuss what a page object actually is in a little more depth soon, but in short, a page object is a class that represents a page of your application. It adds a level of abstraction between your tests and the specific implementation of a page. If that explanation doesn’t make any sense at all, don’t worry, it’s much more easily demonstrated with an example. Let’s suppose you’ve got your tests set up, and everything is working fine, but then you need to make a change to the structure of your template. Perhaps you have renamed some classes or you have changed the level of nesting of an element. Now the CSS selector you are using for your E2E test is incorrect and all of the tests related to that will be broken. You will need to find every instance of that selector, and update it. This is one issue that page objects can solve for us, another is that of navigation. Protractor is designed to work well with the browser and provides methods for navigating about an application through the URL. Although an Ionic application is technically a website that runs through a browser, it doesn’t behave like one – it behaves more like a native mobile application and so does its navigation. Rather than relying on routes in the URL to determine the page, Ionic 2 follows a push/pop style of navigation. to direct the browser to the products page. This is an issue for Ionic because, as I just mentioned, Ionic’s routing is not based on the URL. NOTE: Ionic 2 does support deep linking which does allow you to link directly to specific pages in an application with a URL, but it is not the method used for routing in general. In order to navigate to the page that we need to test with Protractor when using Ionic 2, we need to direct the browser to the index page, and then trigger a series of clicks to navigate to the page that we want to start our test on. Although using a page object does not entirely provide a solution to this problem, it does make it easier to manage. In order to demonstrate how a page object can help deal with the issues I talked about above, I am going to use an example from an application that I am currently building. We will take a look at an E2E test that I have written, we will see what it looks like without using page objects, then we will see what it looks like using page objects. On the surface, this E2E test looks pretty sane. We set the test up by first navigating to the relevant page by triggering a click on the module list, and then we test whether or not a user is able to view lesson content by entering into a lesson and checking the content. The location of the page changes. Right now the page can be accessed by pointing the browser to the root of the application and performing one click. But what if the application becomes more complex than that? Perhaps a login page is added, or there may even be several pages added before the user can arrive at this one. This is going to make the beforeEach setup for each test quite messy. The CSS selectors change. We are grabbing references to elements using CSS selectors, but it’s not too hard to imagine that at some point those selectors may be changed (especially if we rely on combinators) – this would mean that we need to change our E2E tests to reflect those changes. That wouldn’t be too much of an issue for this simple example, but if you are referring to the same element in multiple different tests, you are going to have to go an update every single reference to it every time you make a change. If you use page objects, this won’t be as much of an issue. 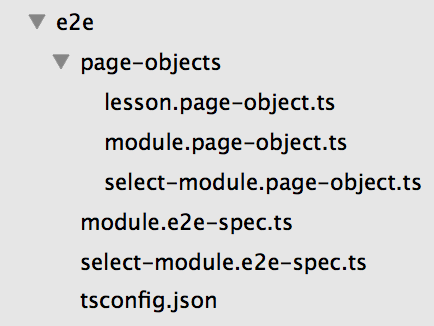 I have a folder specifically for page objects, and name them [page-name].page-object.ts. You can use whatever structure you prefer. Let’s take a look at what one of the page objects actually looks like. in our tests, we create a function in the page object to access it instead, then our tests will reference the function instead. This way, we are only ever referencing the CSS selector in one place. If we ever need to update the CSS selector later, then that means we will only need to make a single update to this page object, rather than multiple updates across different tests. I have also added a browseToPage method. The purpose of this method is to specify the steps to navigate to the page that the page object represents. This way we can just call the browseToPage method in our tests whenever we need to navigate to this page. Also, notice that in this page object I am importing another page object. To navigate to this page we need to click an element from another page, so again, instead of manually referencing it here (which may need to be updated later) we just grab the element from that pages page object instead. The test looks pretty much the same, but it’s a little neater and simpler now, and won’t suffer from those maintainability issues we discussed earlier. This was a pretty basic example, the benefits of using page objects may be more obvious on a more complex test suite, but I think that this example shows why page objects can be useful to help structure your tests. In the next part of this tutorial series, we will go into a little more depth about what kinds of E2E tests you should write and when you should write them.